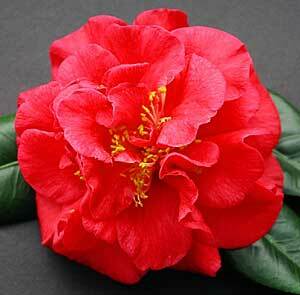 This delightful species, the most versatile of all Camellias, has greatly increased in popularity over the past few years. Advanced trees are literally covered with the dainty blooms, which are made more conspicuous by the diminutive and usually dark green leaves. They flower in Autumn. With their graceful growth habit and and gentle foliage they are most pleasing at all times, as specimen trees or when planted as an informal hedge. They are exceptionally sun hardy and mainly of upright growth, more vigorous than that of C. japonica. Some are more compact in growth and charming when trained, espalier fashion, flat against a wall or fence. The blooms are almond or musk scented, most varieties being single with gold-tipped stamens (like dog roses). They are individually short lived, but quickly and profusely replaced, falling petals carpeting the ground. Pick when half open for decorating. Members of the species hiemalis, vernalis and hybrids, so closely resembling the species sasanqua, are included under this heading.